This document describes a variety of tcpdump commands to make life easier and more transparent. 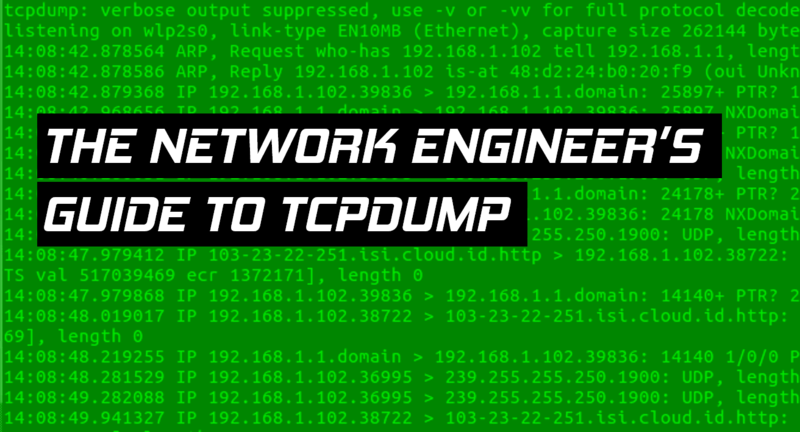 TCPDUMP is used on ubiquity firewalls, unix boxes and a variety of other linux- or unix-based networking equipment. The following primer covers the basics of tcpdump and most commonly used options that I have found useful. By default, tcpdump turns on name resolution. For all layer-3 and layer-4 sources and destinations. tcpdump automatically looks up the hostname as well as commonly used ports and translates them for the viewer. Being that most folks are looking for IP addresses and ports when running a network analyzer, first thing we do is turn off name resolution. So by default you can see ARP requests, but where is the layer-2 address? -v Basic verbose information, also usually turns on checksum validation and number of packets captured when using the -w (write) flag. -vv Additional fields for a variety of protocols such as SMB and NFS. -vvv The most verbose output. 0x0000: 4510 00f8 9e44 4000 4006 7edf 0ade 02c9 E….D@.@.~….. If you want to capture only conversations going to 201, use dest host $IP. Just like host, you can use tcpdump src port $port for source ports, tcpdump dest port $port for destination ports or tcpdump port $port for either. Use these just like any other filter, at the end of any options. If you are adding to a host or any of the other filters above, put the whole thing in quotes. Many instances exist where you just want to filter for just traffic to a certain host going to a particular port, using just specific flags, or maybe all traffic except from a specific port. Lucky for us, tcpdump supports ‘and’ and ‘or’ operators as well as grouping parens and not statements. As soon as you have a space of any kind in your filter you want to encapsulate the whole thing in quotes. There are many combinations, just remember *If there is any question on the order your statements will be applied, use grouping parens. * As soon as you have multiple filters, use quotes around the whole thing. Looking for more content like this? Check out the Networking Section of our blog or subscribe below!